Normally I don’t pay much attention to blockbuster movies, but in listening to one of the Oscars episodes of the Unspooled podcast, my curiosity was piqued. Box Office Mojo is a treasure trove of stats on gross earnings of mostly-American films. There are all sorts of metrics you can investigate on their site, but I found the All Time Worldwide (Top 20) and All Time Domestic (Adjusted for Inflation) (Top 30) to be the most interesting overall. No women directors other than Disney’s Frozen at #13 worldwide (#112 domestic), which was co-directed by a man. Patty Jenkins’ Wonder Woman is #73 worldwide and the new Captain Marvel is rising quickly, currently at #91. 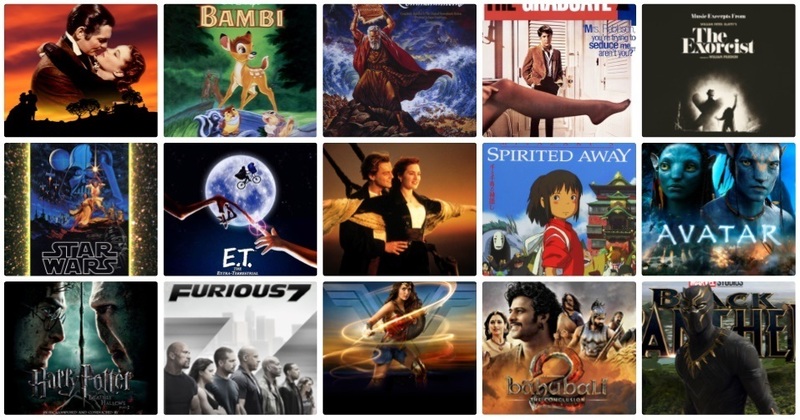 All but 2 of the worldwide films pass the Bechdel Test. Only about half of the domestic titles pass, and that trend hasn’t changed in recent years. All but 4 of the domestic titles are on the 1001 Movies list. Only 4 from the worldwide titles are on the 1001 Movies list. There is not really a close correlation to the film’s blockbuster rank (on either list) and the number of IMDb votes, but 10 domestic titles have been on the IMDb Top 250, and 3 worldwide titles. Top earners with less than 120k IMDb votes (domestic ranking): The Ten Commandments (6), Doctor Zhivago (8), and Fantasia (23). India’s Baahubali 2 and Dangal are also under 120k votes, but have earned over $250mil worldwide each. The worldwide market apparently likes The Fast and the Furious franchise, as well as anything superhero-related. Domestically, only The Avengers (2012) and Black Panther made the top 30 (#29 and #30 respectively). 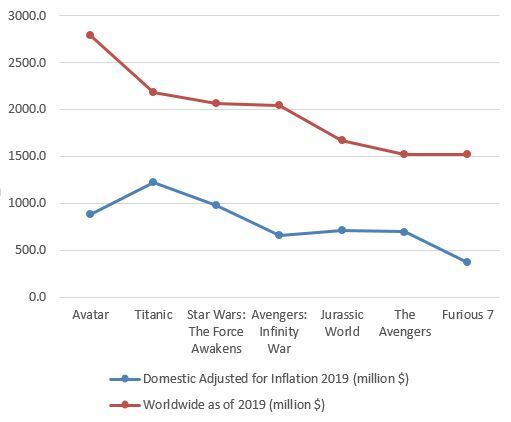 The top 4 worldwide ($2bn to $2.8bn) blow everything else out of the water – compare that to #5 Jurassic World at $1.7bn. Likewise, domestically Gone with the Wind $1.8bn and Star Wars (A New Hope) $1.6bn far exceed the rest of the top 10 which average about $1bn to $1.2bn. I added a few of my personal favorites. The Matrix was the #1 R-rated domestic in 1999 but currently only #228 Worldwide. Rain Man was at the top in 1988 but still only #152 all-time domestic. 2001: A Space Odyssey fared similarly at #148. I was surprised that Mexico’s Like Water for Chocolate is in the Foreign Language Top 10 Domestic. Some standouts I’d never heard of: Sergeant York (1941) and Jet Li’s Fearless (2006) – I was a little burned out on martial arts films in the early 2000’s, so this one wasn’t on my radar. Go to the full Google spreadsheet to sort and filter.